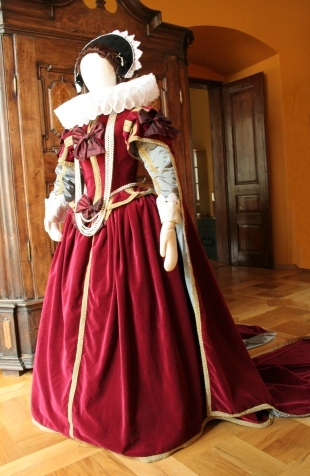 It is a recreation of Constance of Austria's dress, wife of Sigmund III Vasa, king of Poland. Portrait of queen made by unknown master is on Wawel Castle (beginning of 17th c., probably 1620). Dress is in Spanish style, with long sleeves and long trained skirt. We made this dress of red velvet and silver tafetta, trimmed with golden tape. Wide ruff is made of 9 meters long band of linnon. We made this dress for Castle in Zywiec.